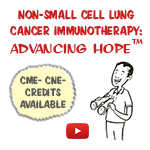 The Society for Immunotherapy of Cancer (SITC) is pleased to present a new and innovative film, Non-Small Cell Lung Cancer Immunotherapy: Advancing Hope™, and continuing education initiative. The newest in a series of videos focusing on immunotherapy for non-small cell lung cancer (NSCLC) patients, this piece is designed to comprehensively educate patients, physicians and nurses in immunotherapy as a treatment option for NSCLC. The program facilitates informed discussions between patients and their healthcare team, creating a shared decision making process used to ultimately empower the patient to determine the best course of treatment for them as an individual. The video teaches the building blocks of the immune system and immunotherapy, while also highlighting FDA approved treatments and potential side effects, and the importance of clinical trials. Through a highly informative and easy-to-understand whiteboard animated story format, the viewer follows a NSCLC patient who is introduced to immunotherapy and is determining if it is the right option for him. “The ‘NSCLC Immunotherapy’ video provides a patient-centric view of cancer immunotherapy treatment and clinical trials, and helps us to empower the patient to have a more informed position when discussing options with their physician,” says SITC President-Elect Lisa H. Butterfield, PhD. For the advanced level of learning needed for healthcare professionals, SITC is now offering CME/CNE certified online activity for nurses and physicians to complete through CME University. Presented through detailed case studies, this online activity is designed to provide physicians and nurses with a more in-depth overview of what they will need to know when interacting with patients utilizing immunotherapy in the clinical setting. This video was produced in collaboration with several other leading organizations across the continuum of cancer care, including Association of Community Cancer Centers, Association of Oncology Social Work, Bonnie J. Addario Lung Cancer Foundation, Cancer Support Community, Lung Cancer Alliance and LUNGevity. SITC encourages media to share this video in the fight against NSCLC. Post on social media outlets and raise awareness about the FDA approved immunotherapy treatments and clinical trials for patients with NSCLC using hashtag #HopeforNSCLC. Established in 1984, the Society for Immunotherapy of Cancer (SITC) is a non-profit organization of medical professionals dedicated to improving cancer patient outcomes by advancing the development, science and application of cancer immunotherapy and tumor immunology. SITC is comprised of influential basic and translational scientists, practitioners, healthcare professionals, government leaders and industry professionals around the globe. Through educational initiatives that foster scientific exchange and collaboration among leaders in the field, SITC aims to one day make the word “cure” a reality for cancer patients everywhere. Learn more about SITC, our educational offerings and other resources at sitcancer.org and follow us on Twitter, LinkedIn, Facebook and YouTube.